In honor of the centennial of World War I, this is the second series in which we follow the experiences of one American soldier: twenty-five year old Milo H. Main, whose letters are held in Spencer’s Kansas Collection. 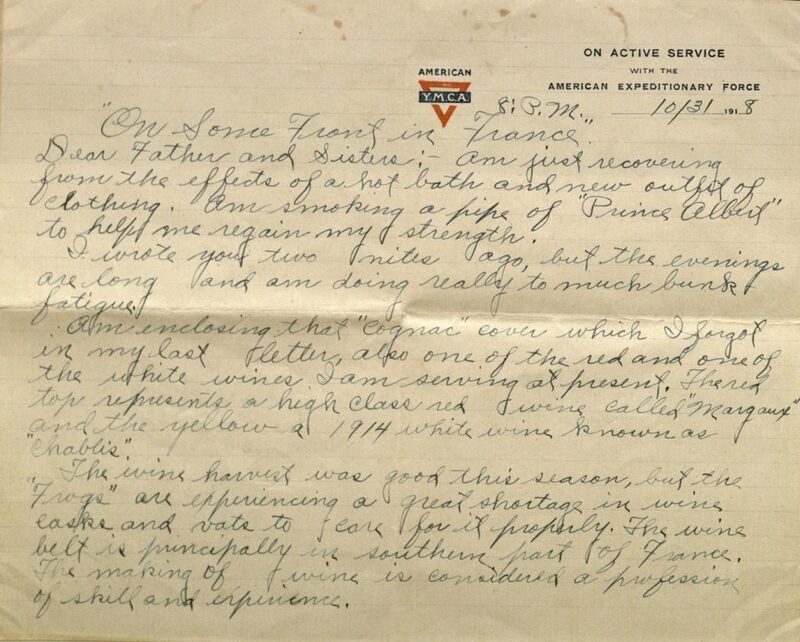 On Mondays we’ll post a new entry featuring selected letters from Milo to his family from that following week, one hundred years after he wrote them. Milo Hugh Main was born in or near Pittsfield, Illinois, on November 21, 1892 to William and Rose Ella Henry Main. The family moved to Argonia, Sumner County, Kansas, in 1901. After his mother died in 1906, Milo remained in Argonia with his father and his two sisters Gladys (b. 1890) and June (b. 1899). His youngest sister Fern (b. 1905) was sent to live with relatives in Illinois. As Milo reported to the Kansas State Historical Society in 1919, after graduating from high school he worked as a store clerk. He resigned in July 1917 and took a position at Standard Oil Company, possibly co-managing a gas station in Argonia. 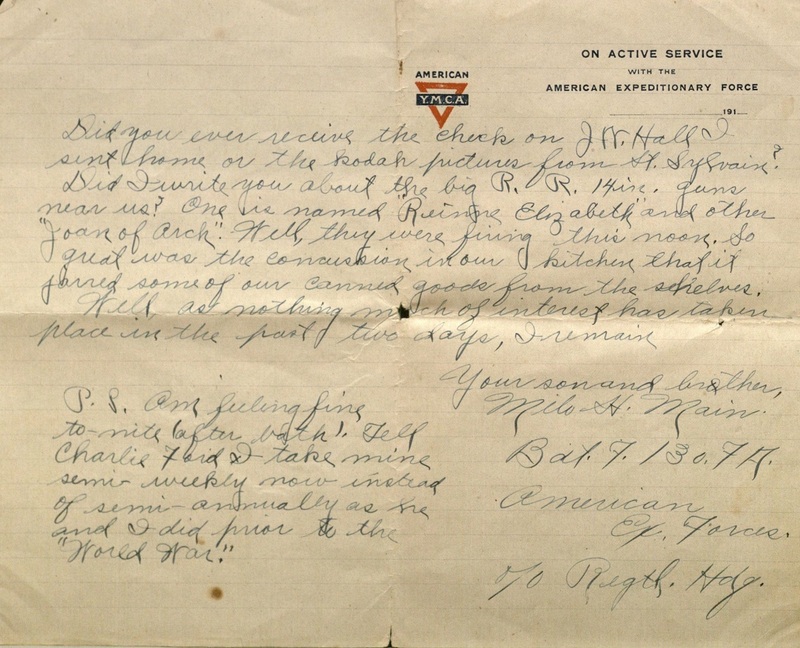 Milo entered into military service on September 21, 1917. He served as a wagoner – a person who drives a wagon or transports goods by wagon – in Battery F, 130th Field Artillery. He was stationed at Camp Funston (September-October 1917) and Camp Doniphan (October 1917-May 1918). On May 19, 1918, he boarded the ship Ceramic in New York City and departed for Europe. Dear Father and Sisters:- Am just recovering from the effects of a hot bath and new outfit of clothing. Am smoking a pipe of “Prince Albert” to help me regain my strength. I wrote you two nites ago, but the evenings are long and am doing really to much bunk-fatigue. The wine harvest was good this season, but the “Frogs” [French] are experiencing a great shortage in wine casks and vats to care for it properly. The wine belt is principally in southern part of France. The making of wine is considered a profession of skill and experience. Yesterday afternoon three “comrads” and I walked over to F. Bat. to see if I had received any mail recently. Was informed that none had been sent up to their advanced position yet. On our little hike along the Front I was halted by two “Frog Soldats,” [French soldiers] whom sold me two souvenirs. One being a pipe or cigar lighter made from the brass casing of a big shell, it looks much like a small leather bound bible, and was engraved “Verdun.” The other was a lighter, and is made of two round buckle ornaments from belts of German prisoners. The wording on it is “Gott Mitt Uns.” Will mail them to you at the earliest time possible. 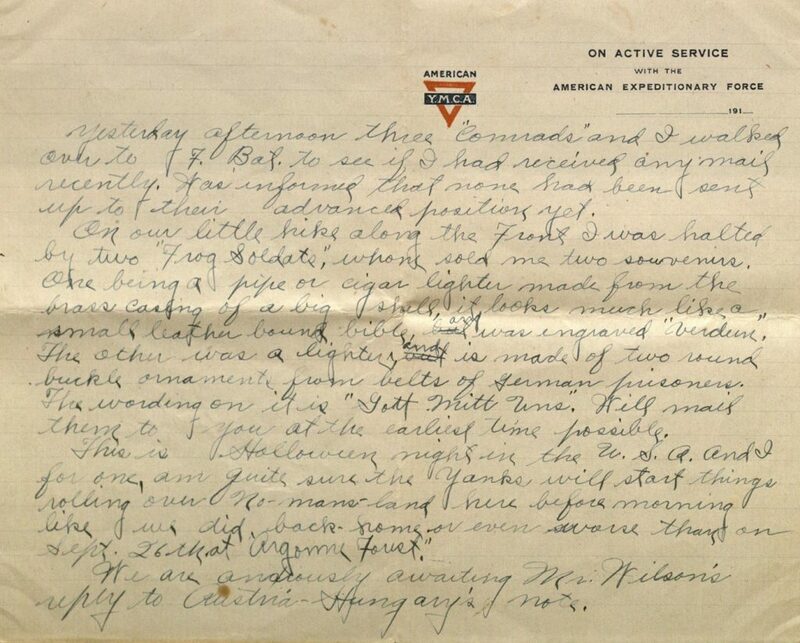 We are anxiously awaiting Mr. Wilson’s reply to Austria-Hungary’s note. Did you ever receive the check on J.W. Hall I sent home or the kodak pictures from St. Sylvain? Did I write you about the big R.R. 14in. guns near us? One is named “Reinne Elizabeth” and other “Joan of Arch.” Well, they were firing this noon. So great was the concussion in our kitchen that it jarred some of our canned goods from the shelves. This entry was posted on Monday, October 29th, 2018 at 9:43 am and is filed under Kansas Collection. You can skip to the end and leave a response. Pinging is currently not allowed.